No, I'm not making a joke about how SimCity's makers doubtless wish they could hit "undo" on last week's embarrassing, disastrous launch. (Though I don't doubt that's the case.) I'm saying I think SimCity actually needs an undo button. You know, Control+Z. A shake of the smartphone. A little button with a backwards-curving arrow on it. Over the weekend, I finally had a chance to play the game for a couple of extended periods of time, and an undo feature was the first thing I found myself missing. The first time I accidentally created (or, in the game's goofy parlance, "plopped") a convention center two blocks from where I'd intended, I reflexively went for Control+Z and found, to my chagrin, that it didn't work. I remember having the same instinct when playing the game at a preview session a little while back. The reflex to hit undo is simply ingrained in my process at this point. When I'm recording music or writing a score, working in Photoshop or writing an article for Kotaku, the ability to move forward and backward in time has become a vital part of my creative process. I'd hazard a guess that I'm not the only one who, upon starting SimCity, found himself reaching for the undo shortcut. And yet the game offers no such option. That's not new for SimCity, mind—impermanence is at the core of the series, and the new game is no different. As always, the bulldozer is your undo button. It's one thing to live with conscious decisions, and quite another to live with accidental mouse-clicks. But there is a difference between the new SimCity and the old games, and it's one that I fear will have a significant chilling effect on my long-term enjoyment of the game. It's tied, as I'm finding most of the other things I don't like about SimCity are, to SimCity's always-online, cloud-based gameplay. Past SimCity games did have a sort of undo button—you could reload your past saved games and undo everything you'd done since you last saved the game. As a result, it was actually freeing that the game didn't let you immediately undo a bad placement or unfortunate strategy. It was possible to spend a half hour seeing if you could correct an error, and then, if you'd really hosed yourself, reload a save and try again. If you did manage correct out of the mistake, it was particularly rewarding. In the new SimCity, that's impossible. You live with every mistake, and so far for me, that's made the game less enjoyable. I like that in SimCity, as in past games in the series, my decisions have consequences. If I decide to encourage gambling in my city, my crime rate will go up. If I run a profitable mining industry with oil power, my skies will grow brown with pollution. But it's one thing to live with conscious decisions, and quite another to live with accidental mouse-clicks. 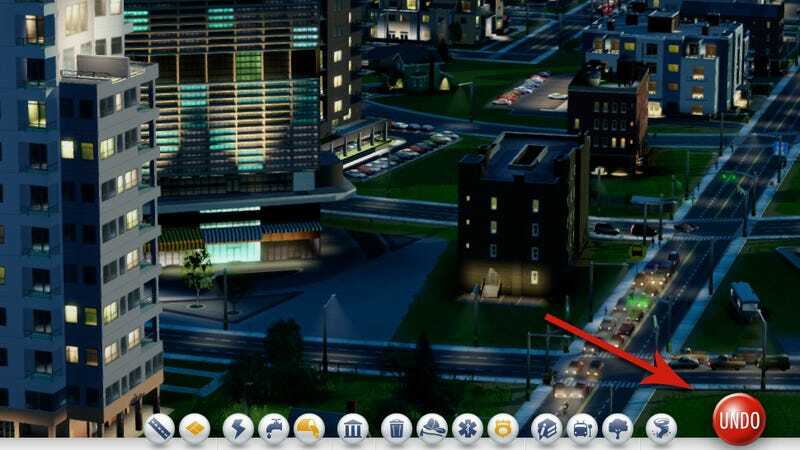 The new SimCity has a relentless, often compulsive forward momentum to it. That, coupled with a lack of true control over the flow of time, leaves me feeling powerless in a way that I don't really enjoy. Mistakes that in past SimCity games would have been a worry-free excuse to experiment instead feel like a frustrating waste of time and resources. Ever since I first played it, I've been concerned that SimCity would feel somewhat transient. As every city is in a constant state of flux, and without the option to create discrete saved games, I worried that it'd all feel a bit like writing in the sand. Now that I've played the game for a longer period of time, I've found that feeling has only grown more pronounced. SimCity encourages me to experiment, but once I'm done experimenting, my only options are to live with my mangled results or clear the slate and start fresh. As a result, I feel like a stone skipping across the surface-tension of a potentially deeper game. I've yet to feel as though I'm actually building anything in this city-building game.